The China Growth Myth Debunked, What Happens When the Credit Bubble Pops? Virtually 95% of all the evidence of economic recovery has stemmed from China in one way or another. Whether it’s the rise in price of commodities (China stockpiling), the global economy (the “China” growth miracle will lead us into a recovery), or even retail numbers (China producers lowering prices in an effort to move inventory), China is linked in one way or another to the “green shoots” nonsense. Indeed, Chinese banks have lent out $1.1 trillion in the first half of 2009: an amount equal to one third of the country’s GDP. Over the same time period, loan-deposit ratios at Chinese banks have only increased from 65% to 66%. Put another way, only the tiniest fraction of the money being lent out has actually gone into deposits. So where has it gone? Well, China’s exports (about 40% of its economy) in July were down 23% Year-over-Year. China’s industrial production is up, but only back to 2001-2002 levels: hardly a sign of major investment. Meanwhile China property values are EXPLODING. According to Andy Xie formerly of Morgan Stanley, property in China now costs roughly the same per square meter as in the US. The only difference is that your average Chinese worker makes 1/7th as much money as your average US worker. And then of course, there is the Chinese stock market which exploded higher starting with the Stimulus plan in November. 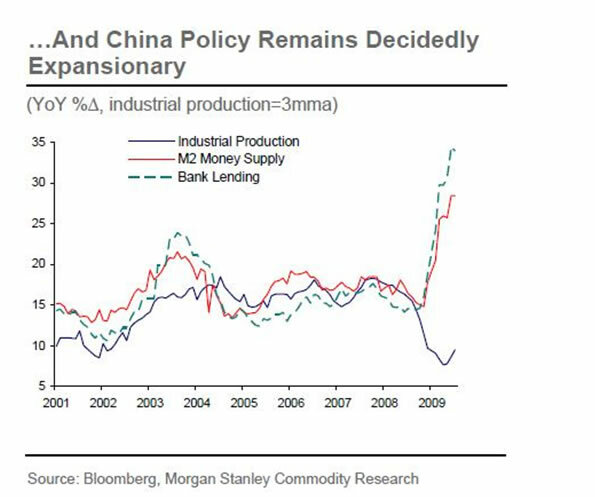 What I’m trying to say is that China’s “boom” has almost entirely been the result of financial speculation. China’s economy is not growing anywhere near what its “official” numbers claim. Instead, the boom in commodities and the Shanghai Stock Exchange have come from Chinese investors taking out loans and piling into the markets. There are stories of Chinese college graduates taking up day trading instead of looking for jobs. Will China become the next economic super-power? Probably in a decade or so. Is China’s economy stronger than the US’s now? They’re certainly throwing a LOT more money around relative to GDP. Can China transition from an export-focused economy to a standalone entity within a year by pumping hundreds of billions of dollars into its system? So what happens when China’s credit bubble pops? US stocks finally catch on two weeks later. As you can see, the Shanghai Index (dotted line) rolled over in earnest at the beginning of August. They did a quick bounce last week, but look primed for more trouble in the near future. Keep your eyes on the Shanghai Index. It lead the US markets up… it will lead them down as well. Whenever the China bubble implodes the US market will collapse like a house of cards. I’ve put together a FREE Special Report detailing THREE investments that will explode when stocks start to collapse. I call it Financial Crisis “Round Two” Survival Kit. These investments will not only protect your portfolio from the coming carnage, they’ll also show you enormous profits: they returned 12%, 42%, and 153% last time stocks collapsed. Swing by www.gainspainscapital.com/gold.html to pick up your FREE copy! !